One of my favorite ways to do therapy with kids was using a vertical surface. There are a ton of benefits to working on a vertical surface including wrist extension, spatial awareness, visual attentions, shoulder and elbow stability, core strength etc. That being said, I also LOVED to use vertical surface activities to incorporate gross motor skills with varied positions. As a school based therapist I could almost always guarantee that I would have a wall or whiteboard available to me somewhere in the school. This made it easy for me to incorporate different activities and positions while working on a vertical surface. I would vary the activities that were being done on the vertical surface based on the set up and the skill level of the child I was working with. I currently choose from several different activities with my own boys when working on vertical surfaces. I loved this activity when working on balance and stability. I would have the child stand at the vertical surface with one foot on the floor and one foot on the solid box, blocks, or stool. This was a great way to work on weight shifts, stability, and balance. Using an exercise ball is another great way to challenge stability and postural strength. I loved to have the child seated on the therapy ball while performing activities on the vertical surface. I loved to use an air disc or a deflated beach ball to work on balance and stability while working on a vertical surface. If I had the room and the equipment I like to set up obstacle courses that ended with a vertical surface activity. The kids may go through the obstacle course several times until they completed the activity. This is one I especially like to do with my own boys. I use a large sheet of butcher paper along the wall and draw a big road on the paper. They follow their cars along the road. This results in lots of good gross motor skill work including squatting, side stepping, lunges etc. For some kids, tall kneeling is a great option to work on gluts and core strength. Adding an air disc or deflated beach ball to this position is another way to even make it more challenging. Depending on what was available, I like to use stepping stones, BOSU balls, or any other product that would challenge balance, strength, and body awareness while working on vertical surface activities. 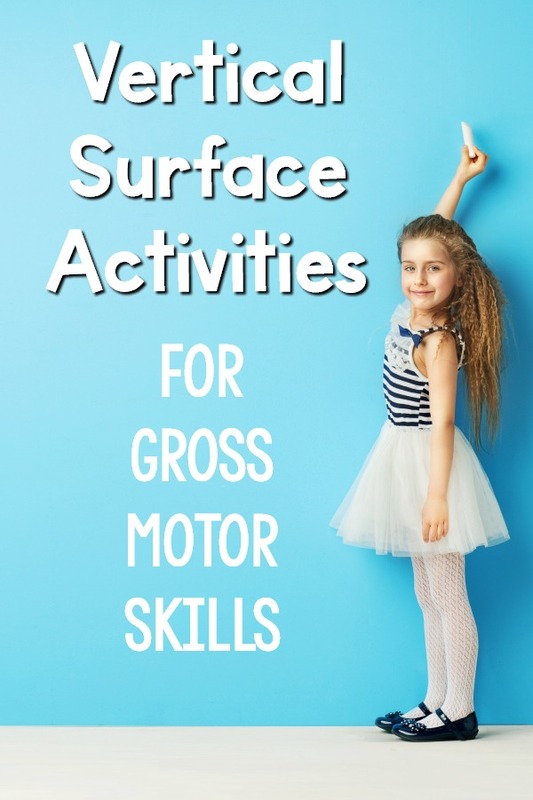 Check out even more ideas for gross motor activities from Pink Oatmeal! Click on each photo for a full explanation of product. Affiliate links.